Talking Electronics for $15.00 plus $4.50 postage. 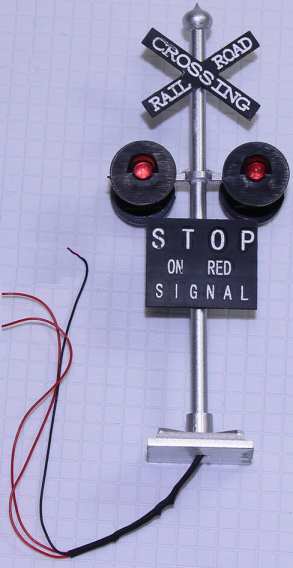 This project operates crossing lights automatically, before the train enters the crossing and turns them off automatically. The flash-rate can be adjusted as well as the brightness of the lights and the overall length of time for the flashing. No other module on the web offers these features. Two LEDs on the module indicate when the lights are flashing and the module comes with 4 extra LEDs for those who have bought crossing signals without the LEDs installed. The circuit has a number of very clever features. It uses two 555 ICs to provide all the functions. The signal diode on the first 100u discharges the 100u quickly when the circuit turns off so the timing can restart with full duration. The flash-rate can be adjusted because everyone says "the flash-rate is not right." The "duration of the event" can be adjusted to suit your layout. The brightness of the LEDs can be adjusted to suit the type you are using. The circuit will take 12v DC as the ideal voltage. Do not go below 10v DC as the voltage drops across the various components gives the second 555 less than 5v because the power diode drops 0.7v, the 47R drops about 1.5v and the first 555 outputs a voltage and current via pins 3 to the second 555 for all the rest of the circuit. There is about another 1.7v drop in doing this. The circuit will work perfectly up to 15v DC and when you supply a DC voltage higher than 15v, the 15v zener comes into action and any voltage above 15v, will be dropped across the 47R resistor. If your supply 16v, the voltage drop across the resistor will be 1v and the current that will flow through the 47R will be I=V/R = 1/47 = 20mA. This current will also flow through the 15v zener and is called the REGULATION CURRENT or wasted current and the wattage dissipated by these two components will not be noticed at the moment. But if the supply voltage is raised to 20v, the "wasted current" will be 100mA and the wattage dissipated by the 15v zener will be 15 x 0.1 = 1.5watts. The zener is 1watt and it will burn out at 1.5watts, so the limitation of input voltage is 18v. The zener in this circuit is NOT called a zener regulator but a ZENER LIMITER. It prevents voltages higher than 15v because the 555 IC's are limited to 18v operation. The circuit is designed to take either two reed switches OR two Hall effect devices (switches). The Hall switches are connected in a very clever way. They are connected so that they sit with a load resistor of 220R and due to the small current they require, the voltage at the "pick-off" point is about 9v for a 12v supply. When any of the input devices detects magnetic flux, they close or produce a fairly low resistance, in the case of the Hall devices and the circuit switches ON. The voltage goes to 0v for the reed switch, but the Hall device is different. When it detects magnetic flux, the output transistor turns ON an this "pulls" the "pick-off" point lower and as it gets lower, the voltage to the Hall device drops too. As the voltage across the device reduces, its capability to keep the output low is reduced and thus the output does not drop to 0v, but stops at about 2-3v. At this voltage the device is still working and pulling the output as low as possible, (with the current that is available at this low voltage). This is sufficient for the 555 to detect a LOW. You can combine one reed and one Hall device as the 220R will cover the requirement of either/both devices. The voltage at the "pick-off" point is detected by Pin2 of the 555. This pin only detects a LOW and when the voltage drops to 33% (or less) of the voltage on pin 8 of the chip, it starts to "time the event." The timing of the event is done by charging a 100u via a resistor(s) and when Pin6 detects 66% of the voltage on the Pin8, the output Pin 3 goes HIGH and the project turns OFF. The only component taking current when the project is not flashing, is the first 555 and this takes up to 10mA. To reduce the brightness of high-bright red LEDs, it takes up to 10k via a mini trim pot. This will allow all different types of LEDs to be used. 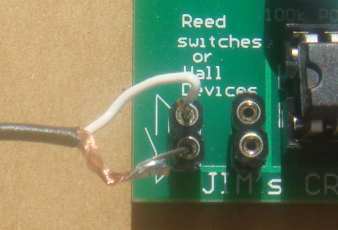 In this project, the operation (the detecting range) of the Reed Switch is about 10mm. The Hall device is much smaller. These are the only differences and you can decide which you want for your layout. The Hall Device must be connected the right way to the circuit. Here is a close-up the Hall device with the output lead connected to the first lead. These two are connected to the white lead of the screened audio cable. The middle wire is the ground connection and it goes to the screening wires. The internal circuit of the 3144 contains a number of "Building Blocks"
The Hall device is being used in an unusual way in this project, with the output connected to the "supply terminal." The circuit above shows some of the "building blocks" inside the 3144 and one of the features is the amplifier block that detects a signal from the Hall block to turn ON the output transistor. Some of the other Hall devices turn-on-slowly as a magnet is brought closer to the detecting face. Make sure you do not use one with this feature, as we have not checked it and it may not turn on hard enough to start the module flashing. The main reason for it not working is the low impedance of the input line due to the 220R load resistor. You may find the Reed Switch is "polarised." This simply means the reeds contain some residual magnetism and when you bring the north pole of a magnet towards the switch, it will only be detected at one end. That's why you have to lay the switch "in-line" with the rails so the magnet will definitely activate the switch as the train passes over. 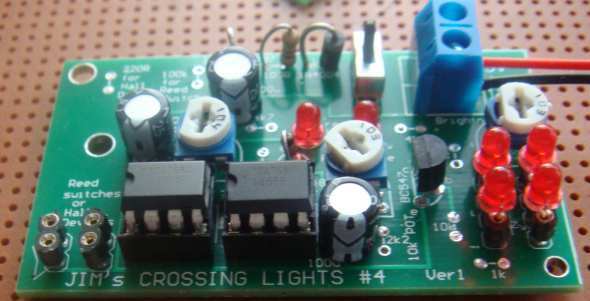 Jim's Crossing Lights module is available fully-built for $25.00 and only needs to be connected to 12v DC. Connect the reed switches or Hall devices to the input terminals and switch ON. Bring a magnet up to the reed switch or Hall device and work out the distance at which it is detected. The magnet must be around the correct way for the Hall device as it detects just the North or South pole, according to the way the Hall device is placed and which side of the Hall Device you are using. Place the reed switch or Hall device in the centre of the track and hold it in place with glue. Glue the magnet under the loco, and have the gap between the magnet and Hall device small enough to make sure the circuit responds every time. There are many different types of crossing lights and most of them have three wires. The black and red wires are shown in the diagram below. Technically speaking, the anodes are connected together and emerge via a black wire. This wire can sometimes have a resistor connected to it and enclosed in heatshrink. You need to remove this resistor as Jim's module has current limiting resistors. The other two wires are generally red and are the cathodes of the LEDs. You can see the drawings on the PCB correspond to the symbols for the two LEDs. The two middle holes are available when each LED has separate wires. The diagram above shows how the crossing lights are wired to the module when the black and 2 red wires are inserted into the socket on the module. If the lights have a resistor in the black lead, this can be removed as the module has current-limiting resistors. The 4 test LEDs on the module are removed so you can fit your lights. 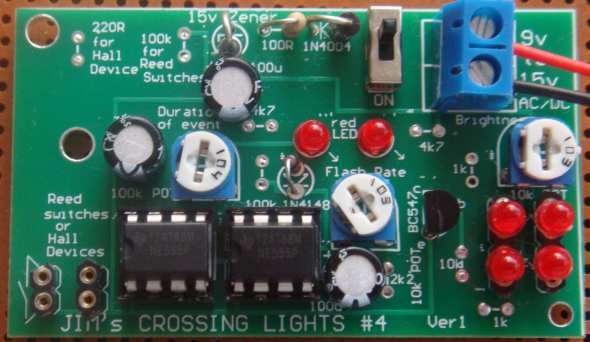 Before buying this project, you need to check the type of CROSSING LIGHTS you will be connecting to the module. There are two DIFFERENT types and the wrong type will not work. That's why we have two different modules. Don't worry about the make, model or style or how many resistors or the colour of the leads on your Crossing Lights. You have to work out if the LEDs are wired as TYPE-A or TYPE-B. Get a 9v battery and place it as shown in the diagram with the positive terminal as shown. Now find the wire that connects to both LEDs and connect a 470R safety resistor and connect it to the positive terminal. Now get the other wires and connect them to the negative terminal of the battery and the LEDs will illuminate. Get a 9v battery and place it as shown in the diagram below with the positive terminal as shown. Now find the wire that connects to both LEDs and connect it to the negative terminal of the battery. If your Crossing Lights do not have any resistors hidden in the leads, you will need to add a 470R safety resistor to prevent the LEDs being damaged. Now get the other two wires and connect them to the positive terminal of the battery and the LEDs will illuminate. The project described above uses TYPE-A CROSSING LIGHTS.